Admin note: For the sake of this post, we are using an $83 million cap ceiling for next season. We are also only looking at UFA deals, so the William Nylander contract isn’t a comparable. Even before the Rangers landed the 2nd overall pick, the “Artemi Panarin to the Rangers” rumors were unstoppable. The 27 year old winger has been a point per game player the last two seasons, and will be the most prolific scorer to hit free agency since Ilya Kovalchuk. Suffice it to say, he’s going to be expensive. The fit with the Rangers is obvious. They have $20 million in cap space with four RFAs to sign. Now all four (or three, depending on how you view Neal PIonk) of those RFAs are key pieces, and they will need to be retained. The good news is that the only player of that group that warrants a long-term deal and not a cheaper bridge deal is Pavel Buchnevich. After all are signed, the Rangers will probably have around $10 million in cap space. That leaves $10 million to get Panarin under contract. But the question is always going to be how much and for how long? 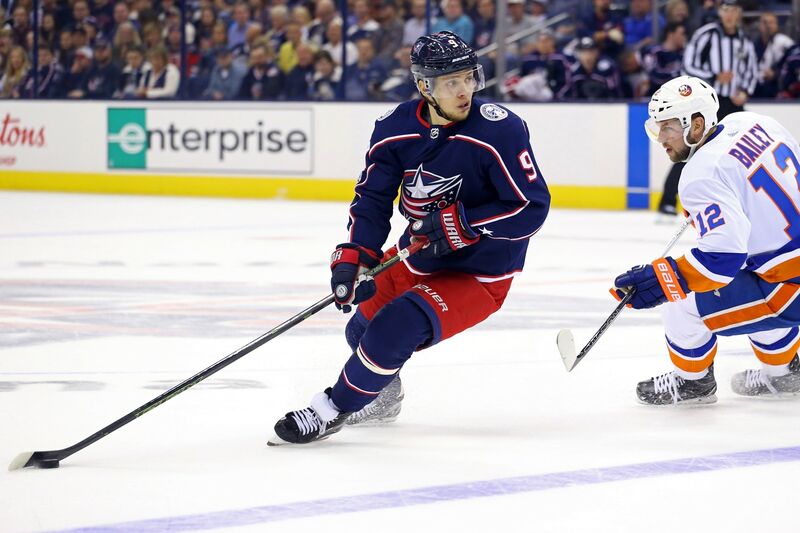 The max Panarin can sign for outside of Columbus is seven years, which would cover his age 28-34 seasons. I think it is fair to say that he will get seven years. Once we accept that seven years is more likely than not, and comes with the usual risks, we can look at dollar amount. Let’s start with the obvious comparable, and that is John Tavares. Tavares got $11 million over 7 years from Toronto last summer with a full no movement clause. Using percentage of the cap ceiling when it was signed, that’s 13.8% of the cap. Tavares is a center though, and centers command more money. Patrick Kane, a point per game player when he signed his 8 year deal with a $10.5 million cap hit to stay with the Hawks at the age of 27. This is a little different because of when the deal was signed (summer of 2014, effective for the 2015-2016 season). The cap ceiling that year was $71.4 million, which made Kane’s deal 14.7% of the cap. In today’s cap of $83 million, it’s 12.7%. This is on the very high end of comparables. All things considered, these are really the only two contracts we can use. Teams have recently started locking up their stars, and even their just very good, to long term deals that ensure they don’t hit free agency right away. That has limited the number of players in Panarin’s position. As much as I want to say that Panarin will come in under Tavares’ number, agents are always looking to be the next “highest paid” player and I’m sure they are looking at Kane’s contract and figuring out how to come in over that. Contracts can be an ego-driven process. Given all these factors, I think it’s safe to say Panarin will come in at the full 7 years between $10.5 million (12.7% of the cap) and $12 million (14.4% of the cap). The sweet spot is $11 million (13.2% of the cap), and is 100% doable for the Blueshirts. Imagine, for a second, that KZB is your 1A line, with Panarin guiding Filip Chytil and Vitali Kravtsov as your 1B line. That’s a lot of talent that can certainly carry a team with a bad blue line. "Projecting a possible Artemi Panarin contract, and his impact on the Blueshirts' plans", 2 out of 5 based on 16 ratings. ← Does drafting Kappo (or Hughes) alter Jeff Gorton’s plans? Oscar, Oscar, Oscar … NO. Come on Dave, we’re kicking a dead horse with the idea of signing the Breadman, he just isn’t worth it…………. Just look at Ilya Kovalchuk, how is he doing, is he worth the money? Kevin Shattenkirk, Boyle, Redden, Gomez, just how far back in history must I go to make a point? Signing these dudes to BIG money, long term usually doesn’t work out well for us. We will get better with this upcoming draft, and will be competitive in two, maybe three years, why pay this guy the kind of money he would demand, for what a marquee name? I posted before that as soon as he signs, we’ll have buyers remorse, and in a few years will be looking to get rid of him. Currently we are paying Girardi money for his buy out. People want to buy out Staal, Smith, Shatty, and the next name will be Panarin. Does anyone see a pattern here? Instant gratification just doesn’t work. Build thru the draft, when the team is ready to make a run, then we can sign UFA’s who can help, or trade for them. In so doing we get the most bang for our buck, and still have the means to sign our current players who are deemed worthy to build around. I say run like hell from both Panarin, and Karlsson, that train has left the station!!!!!!! How the heck did I get ten reactions as soon as the post was made????????? Because Walt, as Sting would say we’re “watching every move you make, every breath you take … we’ll be watching you”! In general I agree with you about Panarin, but honestly he’s better than all those players mentioned … and Kovy was older, much older when he signed his K. I could live with Panarin signing, but I would be happier waiting a year or two to truly compete and saving the money for future elite players (ours or maybe even someone else’s). I think we need to look bigger picture. If we bring in Panarin we can then look to move Kreider for a top D man. I can’t see long term deals for both. We need a top D man. Even if we can get Fox, he will need time to develop. Top 6 with Zib, Buch, Kravtsov, Kakko, Chytil, Panarin would be fine, if Trouba for example were leading the D. So from my view it becomes we pay Panarin about $4.5 mill more than Kreider on a long term deal…assuming he would get $6.5 mill and Panarin gets $11 mill. Then we bring in a Trouba, for example, and offer him 7 or 8 year deal at $6.5 to $7 mill. It would cost Kreider + something. Why would it cost Kreider and someone? Kreider is more valuable then Trouba or at worst case equal value. Sorry Andy, the problem is simple here, the Rangers are not ready yet, they are building, and nobody is ready to set the NHL on fire yet, because they are young. Patience is the key. Just because we got the #2, doesn’t mean patience goes out the window, it helps the move forward, but patience will help it more. Not knee jerk reactions to it. Pretty much agree with Walt. Let’s keep our options open until we are ready for a run. Admittedly, I would have paid Mark Stone that money but for different reasons than Panarin. Dave, you back your position with factual numbers. The first two lines should bring the offense the Rangers’ need to challenge. But, is there enough cap space for the third and forth lines and entire defense to be solidified? Reality is that we can afford to sign Panarin today … and in 2 years we take off circa $25m in salary cap (Staal, Shattenkirk, Smith and Hank). I do believe Panarin is an elite player. I also think due to his late entry to the NHL and the lack of an injury history that he could probably keep his elite status through most of a 7 year contract. That said I would rather pay a generational talent that becomes available on the UFA market $12.5-13 million than an elite player $11m. It’s a tough call, I don’t think the question about signing Panarin is an easy one, it’s very gray. I’m not saying I disagree with you but also in 2-3 years players like Kravtsov, Chytil, Anderson, and Kakko are going to be negotiating for their second contracts. That’s exactly why if they sign Panarin that I think Kreider is gone. They won’t pay Panarin and then give Kreider a 5-6 year 6.5 million dollar extension. It would put them in the exact same position the leafs are in right now. There won’t be enough money to go around to pay everyone. Remember though, we weren’t up against the cap this year and we just moved about 13m out at the trade deadline (Hayes, Zucc and McQuaid). We can afford a UFA, the question comes down to WHICH ONE, WHEN and WHAT type of NTC will we give them. If you can get Panarin at $10-11m with a full NTC for 4 years and a limited NTC for the last 3 years, it might be worth it … OR, is their a generational talent on the horizon that might be available in 2-3 years? Again let’s remember we’re going to shed over $25m in just 2 years, actually over $29m because Girardi will come off the books as well as Belesky. That’s a lot of money to spread around down the line. Barring some major breakthroughs I don’t see both Chytil and Andersson commanding HUGE salaries, especially Andersson (it would only be a good problem if both did). Kravs and Kakko have yet to play a game in the NHL, so they will be at least 3 years away — and again, unless one or both comes in and withing the 3 years is scoring over a ppg, they aren’t commanding Matthews or Marner money, at most it will be Nylander money. Same with the goaltending and the defense, aside from possibly Tony D. …. Miller and Lundkvist are at least 4 years off from finishing up their ELCs, Rykov, Hajek and a guy like Lindgren don’t appear to be elite high priced guys … listen, there’s prospects doing well ($3m-5m) and then there are prospects doing incredibly well ($6m-10m), we’ll be very lucky if two of them turn out to be strong elites so early in their careers — and that’s the trick, when you know you have elite talent sign them early. Bridge deals can be a trap. And no I wouldn’t be disappointed if they signed Panarin. Personally I would rather them keep Kreider and sink some money in to the defense. They have elite talent on offense, elite talent coming through the pipeline in goal, and a lot of question marks on defense. The player with the highest ceiling on defense (there is debate on Skjei here) only started playing defense a few years ago. I think the Panarin signing is way too costly when you are bringing in all these kids right now. The entire team needs to develop and Panarin won’t push us over the top, not now anyway. My thought is let Panarin go to another team and let’s continue to build and develop this team. We are not having problems scoring goals and the team is competitive at the moment. By the time the team is going to be really ready to complete for a Cup Panarin will be in the third / fourth year of his deal and 30 years old. The hidden cost for signing him will be the players that we can’t afford to sign in those three years. We could be losing Kreider,Vesey,Strome and quite possibly our Russina goalie that everyone thinks will replace Lundqvist along with some others that we can’t afford. That’s the real price of signing Panarin. All said and done…its just too soon to go signing an elite player…we need to let the kids / team develop more…give them at least another two seasons and then look for a signing..if you can afford to. If we move past Panarin and give the team time to get past the Staal and Shattenkirk contracts I think we will be in excellent shape to build a powerful defense and high scoring offense. Remember, we have Kravstov and Kakko being added next year. Something tells me scoring is not going to be the issue. Defense will be the issue. Let’s Go Rangers!! If Panarin signs for 11/12 mill and you want to keep Kreider then Names and Vesey are goners for 2021 (not a problem). That frees up close to 7 mill. With the cap likely to go up again, any/if RFA’s (Giorgiev, Strome) and Kreider can be paid. The celebration comes in 2022… no more Smith, Shatty, Hank 😢, Staal 😁, and literally great cap relief. Talking around 24 mil or so, I’m ambivalent towards a Panarin signing, but it might be worth it. With Kakko, Panarin, Kravtsov… offensive players that can control game pace and possession the defense automatically improves… a little😏. Depends where he slots in after next year, how long the term and whether he can hit 45+ points I would think. The issue with signing the Bread man to a long-term deal is the Rangers best forward Zib would be making earning half his salary. I must rather see the Rangers sign Kreider for leadership and give the kids a chance to play on the top 2 lines. Especially now with their young forward showing do much promise. Fair statement because if he can improve slightly on this year’s production and hit 80 points+ then he’ll be looking for $9-10m per easy when his contract is up. It really might behoove the Rangers to set up their own salary structure rather than inflate it with a high priced UFA at this time. That’s just another reason why this is such a tough call. I suspect that the two will improve the defense considerably because they both have a very good 200 foot game. In a non cap era, Panarin would be a good signing, but that era is long gone, to never return. We could ill afford to pay huge sums of money for a player that won’t change the dial too much. Where the hell is Mint, his boy Hayes has gone into hibernation, he’s been silent for some time now, especially in the PO’s. I guess he has his seasons mixed up thinking that spring is the time to call it a season, and play turtle not to be seen!!!!!!! Panarin’s contract will be 7-8 years (It could be 9 for some crazy teams), 11-12 $millions per, so the total will be in the range of 70-95 $millions. Don’t forget NY is one of highest income tax state, so maybe 11.5-12 million/year. For someone here says NYR should wait and pay for a ‘generational talent’, not a ‘elite talent’ like Panarin…??? When was the last time a NHL team let a ‘generational talent’ to be UFA? Especially in current environment where every team is locking up their young talents? Another young good player that no one mentions here is Mitch Marner. The Leafs don’t have enough cap space to sign him, so maybe a trade or an offer sheet…? As we have seen Gordon and his team have been better in trades than drafts. In the first place he can only sign a 7 year contract with any team other than Columbus, Columbus can sign him for 8 …. and I didn’t say wait for a generational talent, I stated that I would rather pay $13m for a generational talent should one ever become available than $11m+ for an elite player. Re: Marner, they’ll probably move some other young talent instead, Marner is arguably one of their 3 best players … they would try and move guys like Nylander or Kapaanen first, cut loose Gardiner and/or Zaitsev. Marner’s cost would be prohibitive at this stage, an offer sheet would mean the loss of at least 4 1st rounders (and they have to be your own 1st rounders). Only way you get him to ny is with a max max nmc. Taxes are ridiculous in New York. Bad news for the fans who have been hoping to get the 1st round pick from the Bolts for the last 2 years…it’s not going to happen. Torts and his crew completely dominated the Bolts.